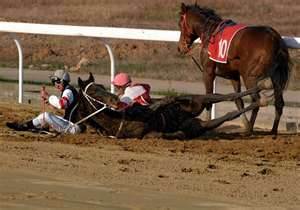 To all the racehorses who died in the dirt for this pathetic excuse for gambling – so sorry for you all. Just reading these death camp lists are heartbreaking for me, somebody who grew up with, and loves the thoroughbred breed. This is not going to change because the ongoing use of doping cocktails to mask chronic issues, pain, suffering, and to get a competitive edge is the acceptable operating conditions for these racehorses. Much worse is the fact that they are running with NO outside, neutral oversight whatsoever. They don’t even have to keep medical records so we have no clue how many doping cocktails they are being given. The only records kept are by the private vets who refuse to release them unless there is a lawsuit, and the records are subpoenaed. This is systemic, legitimized animal cruelty, and there is no other way to categorize it. This is not entertainment, this is a blood bath. As we continue to be a voice for the voiceless racehorses dying in the dirt, we implore you to STOP supporting this carnage. Yes, Gina, this is a renagade operation and a disgrace to to our society. Nobody will touch it or step up to intervene for the horse because of the inherent power and MONEY. Of course, the power is derived from the money. If the money goes away racing will too. That is the key.